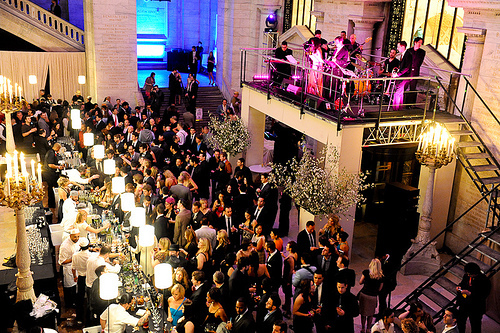 On Friday evening, May 13, the stately New York Public Library (NYPL) transformed into the City’s — if not the nation’s — largest cocktail party for the kick-off Gala of the five-day 2011 Manhattan Cocktail Classic. Massive lines formed outside the NYPL, replete with velvet-rope treatment, for the sold-out event. Boas, fedoras, spiked heels and smoking jackets adorned many of the decked-out, 3,000-strong cocktail set, with plenty of eye-candy to spare. Awaiting them were dozens of spirit brands’ bar stations, manned by star bar chefs, turning out hand-made cocktails using the sponsors’ tipples, not to mention several DJ’s, live musical acts, hors d’oeuvres and some interactive art installations on the NYPL’s four cacophonous levels. On Friday evenings, I’m normally on a train, headed upstate, but a press invite to the Classic declaring 2011 “Year of the Negroni” persuaded me to postpone my commute. I’m a fan both of Campari, the brilliant red Italian aperitif/bitter, and of the Negroni, a classic Italian cocktail composed of equal parts Campari, sweet vermouth and Gin, stirred with ice, and best on the rocks (since the drink is all spirits), garnished with an orange slice. There are various versions of the Negroni’s origins, but we know for sure that Count Camillo Negroni, sometime between 1919 and 1925 (the exact year depends on the source) in Florence, Italy, asked a bartender to stiffen up his Americano — a popular 1920s cocktail made of equal portions Campari and sweet vermouth, topped with soda — by substituting Gin for the soda. A classic was born. Bursting with botanicals and an appetizingly bitter bite, a well-made Negroni has great balance, stimulating, rather than dulling, the palate, despite its strength (unlike most Martinis). And because it’s so drinkable, watch out! 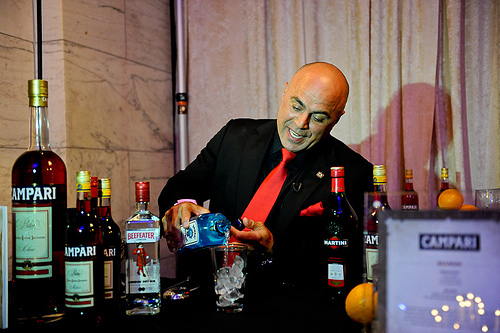 At the event, Campari’s Negroni bar was conveniently near the entrance, where star mixologist, Tony Abou-Ganim (left), held court, stirring up definitive Negroni versions for the persistent crowd at the stand, and for many of the cocktail royalty present, who know him from the business. 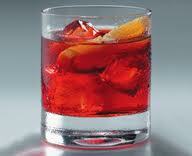 I asked the Campari rep on hand about their declaration of the “Year of the Negroni”, its timing, etc. She quickly acknowledged the marketing motivations, but stressed that the idea really “came from the field,” where the Negroni is popping up on bar menus — and being consumed in copious quantities — all across the country. Some drink lists are even offering Negroni “menus”. For Abou-Ganim, who had his first Negroni in 1991 as a bartender at the legendary Harry Denton’s in San Francisco, it remains a favorite, particularly because it allows for so many variations. Campari is a constant, of course, but there are myriad Gins and vermouths available, offering extremely diverse flavor profiles that can be mixed, matched and, for a successful drink, need to be balanced. “I believe this is why so many young bar chefs have embraced the drink, which in turn has led to its comeback,” he said. And what would be his dream Negroni? He smiled, demurred and then gave an example of his thought process. “I really like Carpano Antica vermouth, for example, but its powerful flavors can easily overwhelm some Gins. So, I cut down a little on the Carpano, and use a bit more of a masculine Gin, like Beefeater, to achieve a balanced drink.” I had him make me one immediately, which was distinctly drier than the Campari/Plymouth Gin/Martini and Rossi sweet vermouth version I had just had. Both were excellent, but in decidedly different ways. A raised glass, then, to the Negroni, a true aperitivo cocktail! This entry was posted in New York City, NYC Events, Spirits + Cocktails and tagged Campari, Manhattan Cocktail Classic, Negroni, Tony Abou-Ganim. Bookmark the permalink.